Tillerman is in Roses for the Laser Master's World Championships. Is tillerman the most mysterious blogger of all time? Seriously, any picture of him is as grainy as the freakin' Patterson film. Then again, I've never seen him in the same picture as bigfoot, coincidence? What's with the red tape they stick across the transom edge? btw practice sails should also be used in the living room. Any time I need to horrify my wife, I unroll a sail in the living room while she's out. Never fails to get a reaction. I don't know what the deal is with the red tape. I think it might be a European thing. I suspect that the reason for the red tape on the transoms was merely to protect the boats during shipping. 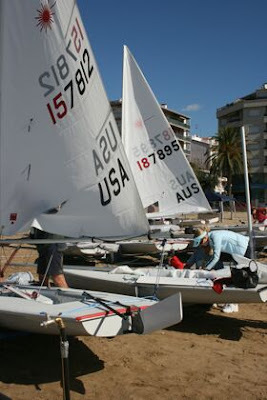 The charter boats at the Masters Worlds in Spain were also used at the senior Laser Worlds in Cascais, Portugal earlier this year. Lasers are often stacked in containers on their transoms and my guess is that this is what they did, and they put the red tape on to protect the transoms from getting scuffed on the floor of the container. For some reason I can't explain, pictures of me and Tillerman always come out fuzzy. Must be a mysterious aura around us. Does Tillerman have only one shirt? or maybe he has a collection of them all the same pattern? Just seems strange that the only shots I've seen of him not in sailing gear he is wearing the same style of shirt! 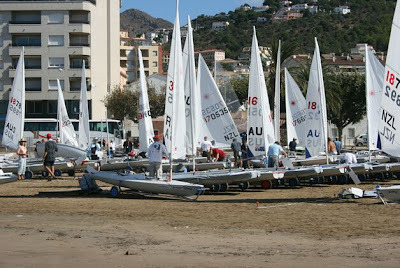 Poll: Should "practice" sails be used for racing? Why use a trailer when you have a truck?